Learn more about our horse retirement boarding options. Our retirees enjoy their days out in lush pastures with their new herd mates, and your horse can have a comfy stall for nights with plenty of shavings. We give every horse lots of love & attention! Whether you have a trusty trail horse, a show horse, or a racehorse who is ready for retirement, 7 Springs Farm can be your horse's dream retirement getaway! Each of our turnout pastures are between 10 and 50 acres on our 640 acre farm. They each have a pond with a natural spring and/or automatic waterers supplied by our well. There are mineral blocks in every turnout, and our pasture has excellent grass forage almost year round. We bail our own quality organic hay that is an orchard grass/clover mix. We are glad to feed extra supplements to the horses that come into the barn at night if you supply them. The number of horses per pasture is anywhere from 3 - 7 depending on the size of the field and which group of horses we are talking about. We have several different groups of horses, which allows us to place your horse with friends that have a similar temperment and activity level. Once your horse has bonded with a group of horses we try not to separate them. 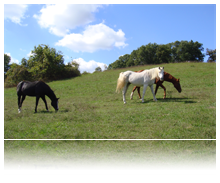 Our location is ideal for the retired horse because the Ozarks have milder winters than the north and cooler and less humid summers than the south. Here at 7 Springs Farm, your horse can be a horse again! If you are interested in meeting some of our retirees, you can visit our meet the horses page. 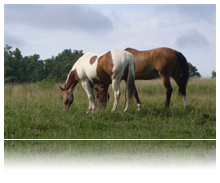 All of our boarding packages allow your horse to be out on high quality grass pasture for 12 - 24 hours a day. Depending on which package below you choose for your horse, you can customize his or her schedule to best fit their needs. If you choose a stall package and want to keep your horse on any supplements you have them on, you can either ship Smart Pak Supplements to the farm, or if there is just one or two that our feed stores carry (such as electrolytes, etc.) we can add it to your monthly invoice. It's up to you. If your horse has trouble keeping on weight, you need to choose one of the stall packages, and we recommend keeping them on similar nutritional supplements	you use regularly to help with that issue. We like all of our retired guys to be "fat and happy!" We know it is a difficult decision to let your horse, a long time friend, go to a retirement farm. 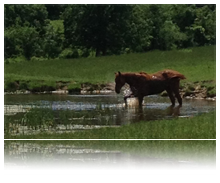 We try to make it easier for you by sending monthly photos and an update of your horse. Possibly even a video every once in a while! That way you can see your horse living the good life and know that you gave them the ultimate gift. Please note that it takes a special horse to live out in the pasture full time. They must be able to sustain a good weight on grass and hay (in the winter) alone. We do feed hay in the winter months when the grass is not enough to keep the pasture horses well fed. We still check on them daily and groom and bathe them as needed. They do not get quite as much individualized attention as our retirees that come into the stall or forage barn daily though. 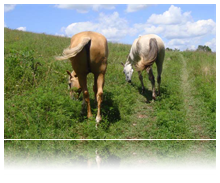 If you choose this option, be aware that we may request you to move your horse up to one of the stall packages if we see them losing weight or becoming too wild/out of control in the pasture. With this plan, your horse will get a little bit more individualized attention. They can come in for nights, or come in for feed and supplements and be let back out to pasture. You can also choose for them to spend the majority of the time in the pasture in the spring, summer & fall, and come in on winter nights. They may also be part of a group that gets to come into our forage barn for regular feeding. We have found that most of the retired horses staying with us do best with a combination of being out on pasture and coming into the barn. Some horses really need the more constant interaction with us bringing them into the barn every day, or they get unruly out in the pasture and don't want to be caught! Every horse is different, and that is why we allow built-in modification to our retirement boarding plans. Whatever is best for your horse is what we want! If your horse needs additional care or is a "hard keeper" you should check out the Deluxe Retirement plan. This is our most customizable plan, and also gives us the most amount of time to spend with your horse. This option is ideal for any horse that needs the most individualized attention. Blanketing, fly mask, leg wrapping, or any other daily medical duties can be taken care of with this plan. This is also the plan to choose if your horse is a "hard keeper" and needs a lot of feed to supplement being out on pasture. 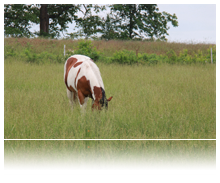 You can still choose to give your horse as much or as little pasture time as you want. They can come in for nights, or come in during inclimate weather, or have access to our forage barn. Whatever your horse's needs are, we should be able to meet them! If this is the plan you believe your horse will need, be sure to give us a call while considering our farm so we can get all of your questions answered and make sure we have the perfect spot for your horse! Don't hesitate to give us a call if you have questions about any of our boarding plans. Our phone number is at the bottom of the page. View our Rate Schedule, including a list of additional fees such as vet and specialty farrier work. GIVE US A CALL SOMETIME! We would love to learn more about your horse and what you would like for him in his retirement! We know how important your long-time friend is to you, and we promise to give him the best of care at our horse retirement farm. Even though you won't be able to see him every day, we send out pictures and a monthly update of how everyone is doing. That way your friend can still be a part of your life.